What do Buddy Guy, Delbert McClinton, ZZ Top, Hank Williams Jr., BB King, Lynyrd Skynyrd, Billy Ray Cyrus, Meat Loaf, Rascal Flatts, Johnny Winter, Rodney Atkins, George Thorogood, Keith Anderson, Susan Tedeschi, Van Zant, American Idol and Walt Disney Pictures all have in common? Grammy® Award-Winning Producer, Singer/Songwriter & Drummer TOM HAMBRIDGE! Tom Hambridge is a two-time Grammy™- winning producer, songwriter, & drummer for his production work on two of blues legend Buddy Guy’s most critically acclaimed albums: ‘Living Proof’ (2011) and “Born to Play Guitar’ (2016). Tom has also produced 5 other Grammynominated albums. He has won numerous W.C. Handy and Blues Music Awards, eight Boston Music Awards and several ASCAP Country Music Awards. He was the recipient of the prestigious KBA (Keeping the Blues Alive) Award in Memphis and has been inducted into the Buffalo Music Hall of Fame. The list of artist collaborators includes: Gary Clark Jr., Eric Clapton, Van Morrison, B.B. King, Gregg Allman, Keith Richards, Jeff Beck, Kid Rock, Billy Gibbons, Johnny Winter, George Thorogood and Susan Tedeschi, among many others. The NOLA Sessions (release June 22, 2018), which was inspired by the beauty and creative depth of New Orleans. 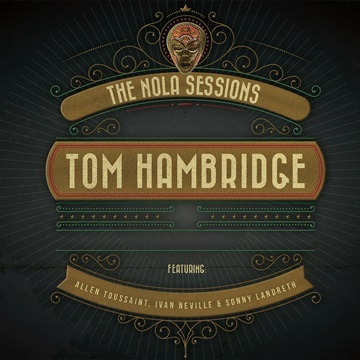 Tom set out to create a biographical blues LP by leveraging the immense talents of local musicians and legends including the late, great Allen Toussaint, Clapton’s favorite slide guitarist, Sonny Landreth, and the B3 mastery of Ivan Neville, as well as rich artistic contributions drawn from New Orleans’ musical heritage.